Photo courtesy of Dennis Sands. © 2013. While planning for the first mix room in the world with Dolby® Atmos™ capability, Sands knew RedNet 6 – a 64-channel MADI-to-Dante bridge – would be the perfect solution. Los Angeles, CA, January 6, 2014 – While outfitting the first dedicated film music mix room in the world with Dolby® Atmos™ capability, multi-award-winning film scoring mixer Dennis Sands needed an elegant solution to connect the multi-channel surround processor to his monitor system. 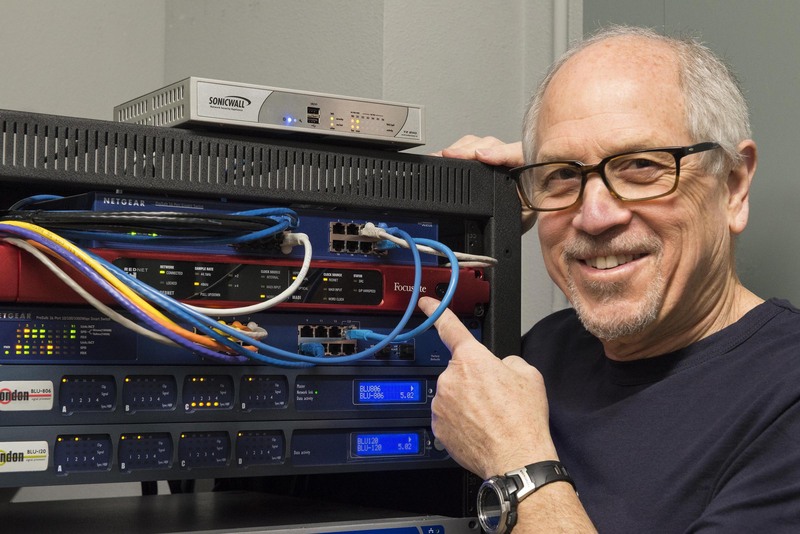 When Sands and his design consultants, Ron Lagerlof of Visioneering Design and Andy Potvin from Dolby Laboratories, Inc., learned that Focusrite would shortly begin shipping the RedNet 6 MADI Bridge, they knew they had found that solution, and—sight unseen—ordered and installed one of the first units to be produced. The Cat 6 cabling also made installation a breeze. “It's a single line. It's all just elegant, simple and easy to deal with. And Cat 6 is relatively cheap: it's one of the great things about the electronics world, really. Quality is increasing, the price is decreasing—and this fits right into that,” says Sands. Sands has worked on nearly 300 feature films as a music scoring mixer, plus over two dozen more as a re-recording mixer, earning four OSCAR® nominations — for The Polar Express, Cast Away, Contact and Forrest Gump — and winning two CAS Awards, including one for Lifetime Achievement, plus a Golden Reel in the process. But as Sands comments, “I consider myself an audio artist, specializing in music.” Over the years, mixing music releases and for television, he has also collected GRAMMY® and Primetime EMMY® Awards.